Margie Profet sent shockwaves through academia by generating solutions to seemingly intractable puzzles of biology. Then she disappeared. At the time of your email, Margie’s sister and I had already been in Boston for a day and were making reservations to bring her home with us. At 6 AM the following morning, we were on a plane to California. Margie had called us on Monday, after someone who knew her Googled her name and found from your article that she was being sought by family and former colleagues. She had not known that people were looking for her and deeply regrets giving anyone cause for concern on her account. We had a small but lovely celebration yesterday. Margie's brother rose at 3 AM and drove 200 miles to await us at the bottom of the LAX escalator for passengers arriving on United. After he drove us home, Margie's brother-in-law, five nieces and nephews, and one little grand-nephew joined us for a celebratory lunch. Another brother-in-law, in L.A. on business from the east coast, came for dinner. Margie also met her new step-Dad. Margie is extremely grateful to all the people who were kind to her during her years of distress. If you wish to release the definitive (though sparse) news about Margie, you have her permission to do so. As one might expect, she is not open to interviews at the present time. She and all her family thank you immensely for your help in reuniting us. TACOMA, Wa. 11/17/13 (Weekly Scientist) -- Our series Unfriendly Fire, about a mass murder in Iraq, led to a major turning point in the Army's case against Sgt. John Russell, say prosecutors involved in the case. Russell pled guilty to the 2009 crimes this spring and -- despite a vigorous and dramatic defense -- received life in prison with no possibility of parole. Exclusive to Weekly Scientist, Unfriendly Fire tells the story of the homicides -- during which Russell shot and killed five Army soldiers at a base psychiatric clinic in Iraq -- from the viewpoint of the Army psychologist, Lt. Col. Michael Jones, Russell had come to kill. Jones had briefly treated Russell just before the attacks, which he survived. Prior to our story, defense attorneys had been trying to paint Jones -- and Russell's treatment -- in a negative light, using the media, press releases, and a concerted PR campaign. After the story ran, a mythology the defense team had been building about Russell's motives and state of mind fell apart. Read the series starting here. SEATTLE, 11/17/13 (Weekly Scientist) -- To stop bombing attacks that killed three people and injured over a dozen others between 1978-95, Unabomber Ted Kaczynski famously demanded the New York Times and other periodicals publish a 35,000-word essay -- dubbed the "Unabomber manifesto" -- that laid out his case for killing. Now, a similarly-themed, 3,500 word "manifesto" has turned up in a hard-to-find book about California's infamous Zodiac serial killings. Both the Zodiac and Unabomber manifestoes blame society to justify the homicides, while praising the criminals. "The failure of law enforcement to deal with this criminal isn't due to his manifestly superior intelligence," insists Zodiac Manifesto author Gareth Penn. "It is due to major failings of our society." An appendix, the Zodiac Manifesto starts on pg. 347 of Penn's nearly 400-page book, a densely-written analysis of the Zodiac murders entitled Times 17. It's been hiding in plain sight since the book's publication nearly 30 years ago. Best known for ciphers, mathematical puzzles, and literary clues he used to taunt police and local newspapers, the Zodiac Killer is blamed for at least 5 murders in the Vallejo-San Francisco area. The case remains unsolved 45 years later. 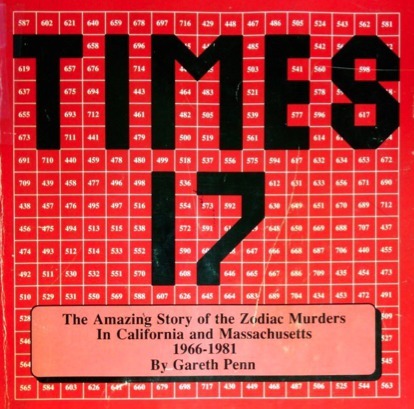 Considered the second most well-known book on the Zodiac case -- next to Robert Graysmith's Zodiac -- Times 17 is also among the least read. Penn, 72, a retired NOAA librarian and Seattle resident, self-published the book in the mid-1980's, printing copies he distributed mostly by mail order. At the time, he lived in Napa, Calif.
Times 17 has become an underground "cult" favorite, partly because it is the only book that pins the murders on a living person by name, a UC Berkeley public policy professor named Michael Henry O'Hare. Today, copies are so rare they fetch as much as $200 on eBay and Amazon. The Zodiac Manifesto -- which Penn titled "What Went Wrong" -- departs remarkably from the rest of the book, much of which is notoriously hard to follow. Clear and pointed, the manifesto praises the killer while chastising enemies he attacked in his own letters, including law enforcement officials and the San Francisco Chronicle newspaper. Society's "first major defect is a widespread and profound contempt for humanistic education, particularly prominent in law enforcement," Penn writes. Dumb cops, he says, couldn't solve the case because they knew nothing about literature, while "nearly all the evidence in the Zodiac case is literary." The Zodiac's famous letters referenced literary classics such as The Mikado, a comic opera, and The Most Dangerous Game, a short story. "The function of the free press is supposed to be rooting out corruption. But how can it perform this task when it is fundamentally corrupt itself? In the interest of keeping hefty revenues flowing, newspapers, magazines, and electronic media pander to the lowest common denominator." The Zodiac Killer famously sparred with Chronicle editors and reporters, for which the Zodiac Manifesto reserves its harshest criticism. "In the particular case of the Zodiac, false reporting...has characterized media coverage, especially that of the San Francisco Chronicle, which is surely one of the ethically and intellectually most corrupt newspapers in the world," Penn writes. "The Zodiac was perfectly aware of the Chronicle's penchant for sensationalism...And so he played the newspaper the way Yizhak Perlman plays the fiddle." "I, meanwhile, have suggested that the most important evidence related to the detection of the Zodiac's identity is his literary legacy," the Times 17 author explains in the manifesto. "How can that legacy be evaluated intelligently when it has been trivialized and bowdlerized by the Chronicle? How can anyone form an intelligent opinion about the facts when the Chronicle consistently reports them wrong?" Publication of the Unabomber's manifesto ultimately led to his identification and capture. So is Gareth Penn the Zodiac Killer? His suggestive writings and long-time relationship with the case -- which he describes at length in Times 17 -- have led some armchair gumshoes to that conclusion. Before Friday, May 8, 2009, Michael Jones had never heard of John Russell. A U.S. Army sergeant growing old without promotion, Russell, charges allege, killed five fellow soldiers with an M-16 rifle just 30 hours later. Cries of “oh god, oh my god,” echoed with the bullets, testimony reads, throughout a small mental health clinic in Baghdad, Iraq. The dead (left): psychiatrist Matthew Houseal, 54; psychiatric social worker Charles “Keith” Springle, 52; engineering specialist Jacob Barton, 20; and two infantrymen, Christian Bueno-Galdos, 25, and Michael Yates, Jr., 19. Among the survivors: Matthew Keener, a U.S. Navy psychologist who wrote a 2012 journal article on combat psychology ethics; and Lt. Col. Jones, then an Army reserve psychiatrist at the Camp Liberty Combat Stress Center and the last mental health professional John Russell saw before he went berserk. 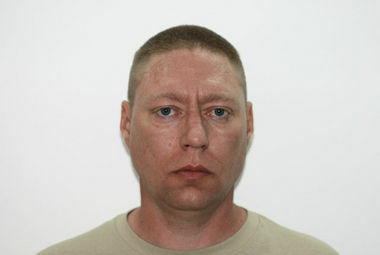 Russell will face the death penalty, military prosecutors announced in May. His defense team—led by a bombastic, high-profile Texas lawyer named James Culp—has floated a narrative their client was not to blame and may be innocent by reason of insanity. “Sgt. John Russell is facing death because the Army's mental health system failed him,” Culp wrote in a March 2012 memorandum about the case. 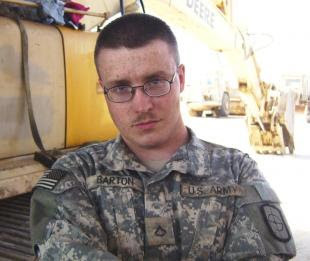 With three military defense attorneys, the U.S. Army veteran and former paratrooper has publicly branded Russell’s care “mental health mistreatment” and “a significant causal factor” in the massacre, which occurred as a long offensive against the Iraqi regime was winding down, and a mundane march toward peacetime realities began. Among caregivers Culp has labeled “borderline criminal,” Dr. Jones, who believes the peacetime reality John Russell saw looming contributed more to the massacre than anything else: discharge just shy of retirement pay; and loss of health care, and other Veteran's benefits, from base shopping privileges to military discounts. Russell wanted another way out that would preserve his benefits, believes Jones, who counseled the sergeant for all of one hour “and change.” The sergeant grew enraged when Jones and the other mental health professionals couldn't deliver a one-way ticket back home. Pre-trial defense posturing, meanwhile, has made the psychiatrist—already reeling from survivor’s guilt and the loss of his friends—the prime target of a blame game that includes allegations meant to discredit his 30-year career and accusations of negligence. Houseal and Springle were close friends, Jones explains. He roomed with Houseal and returned to an empty bunk a few feet away the night of the murders. 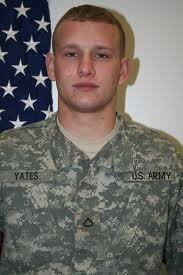 He has survived the shootings only to see his named splashed across the media as the “real reason” Russell shot his good friends and three other soldiers in cold blood. Jones first saw Russell’s name on an appointment calendar late Friday afternoon. Russell had seen Springle earlier that week, and the psychiatric social worker wanted a second opinion from a psychiatrist who could prescribe medication if needed. He scheduled Russell for an appointment with Jones on Sunday, May 10. An “astute clinician who called a spade a spade,” Springle—a career Navy commander—left minimal comments in his progress notes about what, if anything, troubled Russell, Jones explains. “Had Charlie thought anything was seriously wrong, his notes would have been a detailed mix of clinical algorithms and gut instincts,” explains Jones. Instead, Springle wrote a “brief, unalarming note” after his session with Russell, Jones says. It followed an earlier session Russell had with psychologist Hrysso Fernbach, a major at nearby Camp Stryker, the sergeant's home base. Jones never had the opportunity to review Fernbach’s notes: they were locked down permanently after the massacre. An 84-year-old scoring technique pathologists use to diagnose and stage breast cancer is getting a 21st-century update from a computer model called Computational Pathologist (C-Path), which uses digital imagery and computer software to analyze more than 6,000 cell and tissue features faster and in more depth than the pathologist’s eye peering through a microscope. “It would not replace human pathologists, but there are things a computer can do easier than a human,” said radiation oncologist Frances Wong, M.D., chief physician for the Fraser Valley (British Columbia) Cancer Centres. Wong did not participate in C-Path’s development, but she reviewed a study about it from research teams at Stanford, Harvard, the University of British Columbia (UBC), and the Academic Medical Center in Amsterdam. According to a study in the November 2011 Science Translational Medicine, C-path generated prognostic scores that were “strongly associated with overall survival” in 576 patients from the Netherlands Cancer Institute (NKI) and Vancouver General Hospital (VGH). The best histological predictors of patient survival are not from the carcinoma itself, but from adjacent stromal connective tissue. Women with worse breast cancer outcomes tended to have inflammatory and epithelial cells in distinct, thin cords infiltrating the stroma. Research reported in 2011 from several American and European universities supports the decades-old hypothesis that people with allergies have a low incidence of glioma: up to four times lower than that of non-allergy sufferers in some studies. 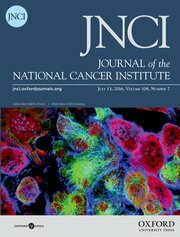 First identified two decades ago, the inverse relationship between allergies and glioma “is one of the most consistent associations in the brain tumor literature,” wrote Darrell Bigner, M.D., Ph.D., director of the Duke University Tisch Brain Tumor Center, in a February 2011 Cancer Epidemiology paper. Although past studies have failed to confirm the inverse allergy association in meningioma and acoustic neuroma, they have confirmed it for glial cells. Our story on missing evolutionary biologist Margie Profet leads friends and family to find her after nearly 8 years! For three decades, a highly regarded Berkeley professor has stood accused of America’s most notorious serial murders. Why won’t he fight back? Can Game Theory Explain Invasive Tumor Metabolism? 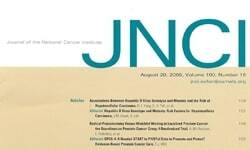 Does Homeostatic Pressure Explain Tumor Growth? Laser Accelerated Radiotherapy: Is It On Its Way to the Clinic? A former senior science writer for United Press International, Mike Martin has written articles for Science, The Scientist, Harvard Magazine, MIT's Technology Review, and the Journal of the National Cancer Institute. His clients include the Epilepsy Foundation, the Association of American Medical Colleges, the U.S. Department of Energy, and the California, Oregon, and Missouri university systems. A member of the National Press Club and the National Association of Science Writers, Martin specializes in news about early-stage university and laboratory research. He was a science journalism fellow at Duke University's National Evolutionary Synthesis Center in Fall 2011, where he completed two stories about Margie Profet -- one for the Journal of the National Cancer Institute and a second for Psychology Today. The latter piece led to a happy ending to her 8-year missing person story. Mike, You have a real ability to suss out the great stories! Once again, you've hit the nail on the head. Sharp, concise, smooth. Nice work. Thanks for your stellar work on this assignment. We're really pleased. I'm glad you thought of us with this story. Good God -- that's the best Zodiac piece I've ever seen. Absolutely brilliant work, Mike. Brilliant. Mike, Thanks for a great job and a very nice story! Her Majesty would very much like to read your article. I would appreciate it if you can send it to this address. Thanks for a great story. I really appreciate the job you are doing. Boy, your coverage is pretty widespread. Kudos on being a quick study. You got it right. Good job. Hope it gets widely read, quoted and acted upon! I really enjoyed your piece on Mark Twain. You do some great work. I'd love to have you contribute to Small Times. I knew Margie well during her time at the University of Washington. I agree with what is said near the end of the article: she was very innovative but was accepted, even embraced, by the scientific community for all of her innovation and oddness. I like that this article takes the optimistic view, implying that we will someday see her again. But I can't see her living a backwoods hermetic life. I fear that she is gone and I will forever miss her. -- George Lake, Professor of Theoretical Physics, Head, Computational Science Program Institute for Theoretical Physics, University of Zurich, Switzerland, on Margie Profet's Unfinished Symphony. [Note: Margie was found shortly after the story appeared]. Really enjoyed reading your story "The Great Green Grid" in E: The Environmental Magazine! Nicely done! Glad to help Mike. The story turned out really well. I got a lot of responses from the story on Google. Great story. Thank you for sharing this with me. Congratulations on a very well-balanced story! Thank you very much for forwarding to me the article from the ST. LOUIS JOURNALISM REVIEW. The article is very nicely done and I appreciate your including my comments in it. Keep up the nice work and feel free to contact me again in the future if I can be of assistance. Cool story! I like the flow of it. Great job! I think think the story reads quite well -- you pulled off keeping the focus on the find well without completely burying or ignoring the tension created by the creation angle. Well written. Good, interesting science deserves publicity. I think your work is terrific, and I am happy to be associated with you and WeeklyScientist! Thanks much for sending the story. Fast & great work. I'm totally impressed. Feel free to pick up my stories anytime! Mike: I enjoyed the article! Thanks for writing it! Thanks Mike! Keep 'em coming! This is a great article. Thanks again for sending it along. Good one...you're going to earn me big brownie points from all the member's press secretaries with that one. Thanks for the great story !!! Thanks for your clips, Mike. Always good to meet someone who's covering science on the outside (as we PIO's say). Nice article. Glad I could be of help. Great article! Thanks for letting me be part of it. The controversy in flat lenses made most interesting reading. Overall very interesting. Best regards --Richard H. Tullis, Ph.D., Chief Science Officer, Aethlon Medical, Inc.